The Amana Refrigerator company has been around for close to 70 years and was founded Amana, Iowa. The original business was called Amana Refrigeration and was best known as the first company to build a home upright freezer who then moved into side by side refrigerators in 1950. The company continued developing high quality refrigerators and refrigerator freezers for the next few decades and today stands as a leader in high quality, affordable, refrigerator products. Although Amana was acquired by Maytag in 2001, they have now been folded into Whirlpool. The Whirlpool Corporation has been on a buying spree as of late and recently acquired the Maytag brand in 2006. Here are just a sampling of the reviews you will find on RefrigeratorPro.com. Click on any of the links above for more reviews or click on any of the links below to get our full review). 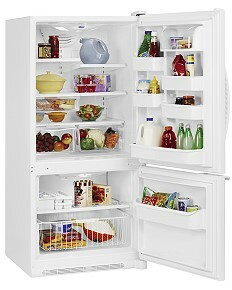 OVERVIEW: OVERVIEW: The Amana AFD2535DEW French Door Refrigerator was recently rated a Consumer Reports best buy. We loved the look and features of this particular model. The refrigerator reviews showed that it effectively maintained temperature and the features were top notch for the price range. The only two complaints we found were that the handles were made of plastic which we felt deterred from the overall look and feel, and that the ice maker worked a bit slower than desired. But overall, we felt this to be a very strong model. Read the Full Review. OVERVIEW: The Amana ASD2522WRS was by far one of the best side by side refrigerator reviews we have covered in this price range. It has an attractive design, it holds temperature efficiently and effectively and it comes with a wealth of features that make this model a true standout. Read the Full Review. OVERVIEW: The Amana ABB1921DEW Bottom Freezer Mount Refrigerator was recently rated a Consumer Report's Best Buy. Unlike most bottom mount freezer refrigerators, this model has a swing out door which we found much more convenient and preferable to the usual bottom pull out drawer. In prior ABB1921DEW models we found that the compressor was too small to adequately refrigerate the entire unit, but we were happily surprised to find that no longer seemed to be the case. Read the Full Review. Depending on the model you purchase, you should expect a life span of approximately 10-20 years of uninterrupted service. Although not quite as extensive a line as some other brands, one thing we did like was the wide variance of affordable styles that are available. Easy Freezer Food Organizer which lets you organize and access your food with greater ease and control than ever before! Interior Fridge Faucet: Instead of an exterior door dispenser, many models have the EasyFill internal filtered water dispenser which puts out cold, clean water any time you need it. Temp Controlled Drawers: This allows you to put all your cheeses and deli meats in plain sight in humidity controlled drawers adding to the lifespan of your foods. Lastly, the Energy Star label is on a number of these models and considering the annual energy savings you could potentially realize, we highly recommend you keep an eye out for this tag. We want to make sure you're as informed as possible, so please find below a number of links to more information to help you discern whether or not this is the brand for you. Amana Refrigerator Reviews: In case you aren't exactly sure which style of refrigerator you want, here's a list of dozens of reviews done by style (french door, side by side, etc.). French Door: The French Door refrigerator is getting a lot of consumer interest as of late, and Amana is right there to meet the demand. Here are a few models we really like. Side By Side Refrigerators: The perfect size for most families, here are our favorite side by side models and why we recommend them. Top Freezer Mount Refrigerators: The most affordable of the Amana line, there are a lot of these models to choose from. See which ones get our approval! Bottom Freezer Refrigerators: There are only a handful of these models available, and only two that really stand head and shoulders above some of the other brands you might consider. Check out which ones we like. Stainless Steel: Hands down, Amana makes some of the most affordable stainless steel refrigerator models available on the market today. Refrigerator Water Filters: Need a replacement but don't know where to find it? Then this resource is the guide you need. What Do You Think of Your Amana Refrigerator? If you want to see Amana Refrigerator Reviews from others then scroll down to the bottom of the page but we need YOUR opinions and experiences, too! This way you can help and be helped. AMANA Refrigerator French Door, Bottom Freezer (Model AFF2534FEB) - Mother Board Issue! 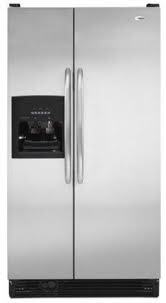 Amana AFD2535DEB Black French Door Refrigerator Review -- It's a Horrible Purchase!! Our 4 Year Old Amana Bottom Freezer Refrigerator Is Leaking Freon! !